A complete work of art and information about Ford cars during this romantic decade of chrome, fins, and dual exhausts. Much of the color photography is by author Mike Parris, one of the country's foremost automotive photographers. Original photography and information from the archives of Ford Motor Company, Henry Ford Museum and Greenfield Village, and the Detroit Library's National Automotive Collection are also featured. This is a must have for any classic car enthusiast. 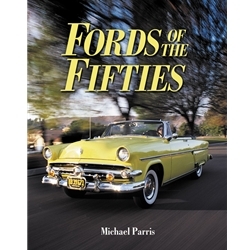 Parris blends a behind-the-scenes story of Ford Motor Company's survival and comeback from 1949 to 1959 with these beautiful images and details of classic Fords. The company was losing $10 million per month during the mid-1940's when 27-year-old Henry Ford II came back from the Navy to take charge and lead the company to one of the most successful decades in its history. After nearing the brink of bankruptcy, Ford Motor Company came bounding back with record profits, memorable products and dream cars that captured the minds of post-war America. This book will become your best source of information for this great period in Ford automotive history.